Advertiser.ie - Galway Business School - Full & Part Time Options available - Now enrolling! Galway Business School - Full & Part Time Options available - Now enrolling! At Galway Business School, one of the leading independent third-level colleges in Ireland, they pride themselves on their ability to respond quickly to the changing needs of students, industry and labour markets. With their commitment to flexibility, accessible progression routes and a strong academic record, they support you as you embark upon a lifelong learning journey. If you are the kind of student who enjoys being challenged — intellectually, socially and personally — then Galway Business School is an institution you should consider for your studies. 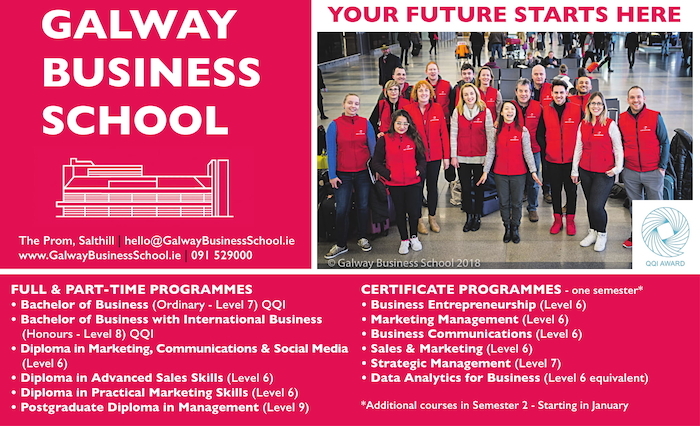 Galway Business School offers a wide range of full and part-time programmes to suit you at every stage of your career, such as the QQI Bachelor of Business, QQI Bachelor of Business with International Business, Ordinary, and Honours degrees, Certificates, Semester and Short programmes. Galway Business School's Bachelor of Business (Honours ) with International Business allows you to enhance your qualifications by topping up to a level 8 degree. This degree focuses on how organisations operate, what they perform, their styles of management and their business strategies. The overall objective of the programme is to provide you with in-depth knowledge and expertise in international business. It provides students with the knowledge and skills required to manage and work in either local or multinational corporations, or more generally in the global context. What sets them apart from other colleges are their small, interactive classes. This, coupled with their excellent links with local businesses, will provide you with an education rich on every front. By the time you graduate, you will be a confident public speaker in presentations and you will also have built up your teamwork and leadership skills. You will have developed a business plan capable of withstanding external scrutiny and crucially, you will be able to relate to others and understand their needs. For more information see www.galwaybusinessschool.ie give us a call on 091 529000 or drop into them in Salthill. Now enrolling!